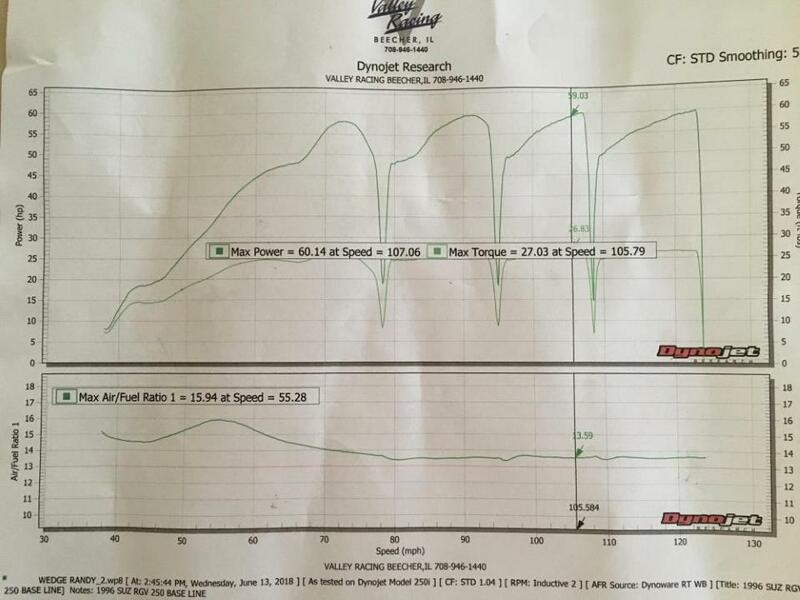 The dyno shop owner said his dyno has always read a bit low to several other dyno's in the area. Another shop has a dyno (same dynojet 250) that consistently reads 10% higher. Needs a bit of tweeking in mid range as it appears that it is surprisingly slightly lean. I'm thinking air solenoids should make it as close as I will need. I ended up running 25% 110VP racing gas and 75% premium. Nice graph and great results. Now to richen up the mid range to get a little more HP in first. Glad to see you ended up at Valley Racing. I'm going to use my Zeel and play with my air solenoid settings and see if I can do that. Might delay my powervalve another couple hundred also to see if I can straighten out the line near the top. It's so long ago that I'm not sure I remember all the details but I want to say that when we retarded the PV opening, the graph took an even sharper up turn and had a more pronounced peak. Our best result was just a touch over 65 on a blueprinted motor. Wish I still had all that data but it went with the bikes to the new owner. What fuel did you run that on? Really high octane is safe but tens to burn slower and that can lose you a little power. I'd like to see that motor running U4.4 back to back against any other fuel. Timing is at the edge so I need more octane than 93 gives when riding hard on the backroads. Making arrangements now with a machine shop to get them fitted to my spare head sometime after I get back from Vacation in July. Pulled my pipes off the VJ23 to clean them up and get them resealed, as they were leaking just a bit when run up to redline. What engine are the 24 valves for? I need to redo the head on my CBX. 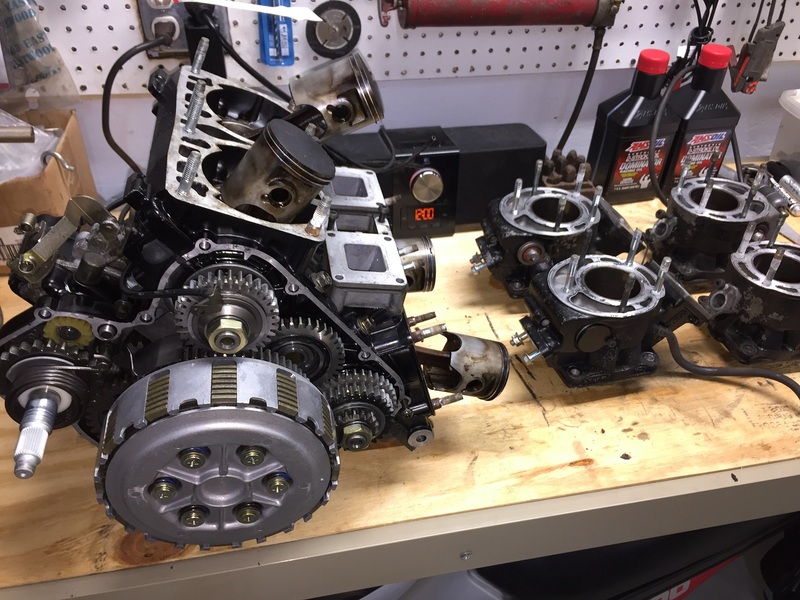 I went through it when i put a new J+E bigbore kit in and cleaned up a head and soda blasted everything. Damn. Look at all of them bits. A reason to love your 2-stroke. Mine runs with only 9 moving parts. Well, the RZV is a bit more modern than my T500. I usually go with saying 9 moving parts - 2 pistons, 2 conn rods, crankshaft, 2 sets ignition points, and 2 slides in the carburetors. That's all you need to run the engine, and control its operation. Seeing all those valves, springs, lifters, and all the other bits reminds me why I love the 2-stroke so much. So it was a faulty valve? or valve seat? on the CBX. Nice bike. I would love a CBX. I own one in my fantasy garage. But the satisfaction of finally getting it right makes up for all the trouble.....at least that's what I tell myself. 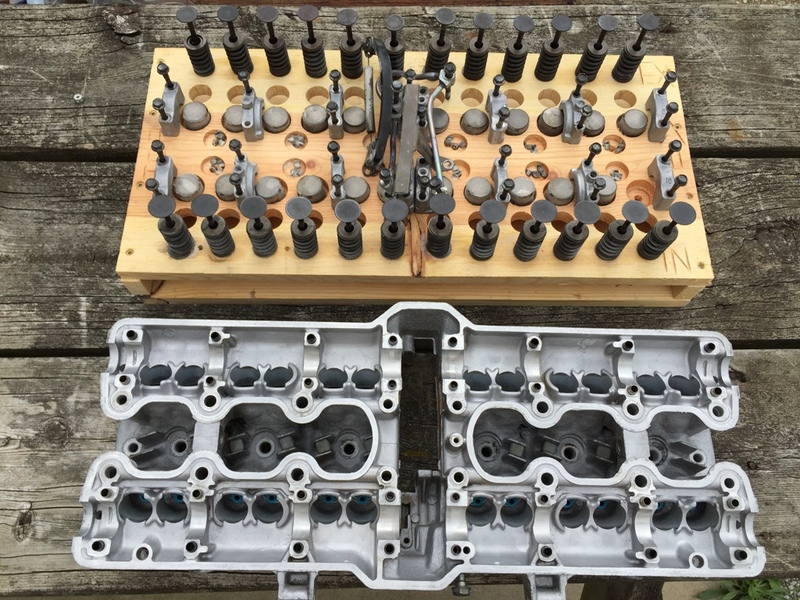 Not sure which it is, but the spare head I have will get all the valve seats redone to match the new valves, so I won't have to worry about the issue anymore. It was a 20,000 mile head I cleaned up and put on my CBX after I put the bigbore in. I'm guessing it is a seating issue, as I do have some compression...just not all the compression it should have. Air was coming out of the intake port when I did the leakdown. I'm guessing it is a seating issue, as I do have some compression...just not all the compression it should have. Air was coming out of the intake port when I did the leakdown. Could have been a tight tappet or too lean mixture burnt the valve out.